1 - (sleep)_________is good for sleeping. 4 - Children do not enjoy _________(go)to the dentist. 6- Would you mind_________(write) your address here? 8 - Is there anything of worth_________(buy)? 9 - It is no use_________(cry)over split milk. 10 - She is looking forward to _________(reach)your destination. 11- I remember_________(read)a review of that film. 12- He finished_________(speak)and left the hall. 13 - Your beard needs_________(trim). 14 - _________(teach) children id not child's play. 16 - She insisted on_________(accompany)us to the theater. 17 - He could not help_________(laugh)at the joker. 19- They burst out _________(laugh). 20- He is thinking of _________(make)his will. 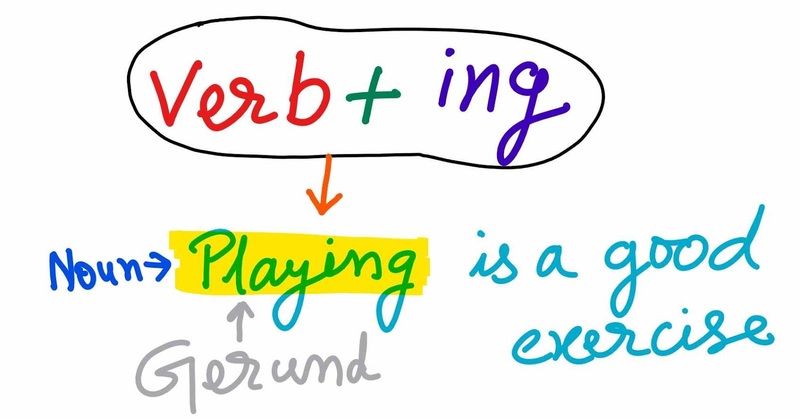 Watch this video to develop concept to Gerund and Participle. 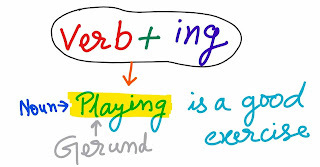 Rewrite the following sentences using a gerund instead of an infinitive in each case I. 1. To quarrel with a child is absurd. 2. To find fault with others is easy. 3. To play with fire is dangerous. 4. To steal is wrong. climb hills is difficult. 6. To ignore the advice of teachers was their mistake. 7. To waste your money is foolish. 8. To see is to believe. 9. To exercise is necessary for health. 10. To eat too much is harmful. 1. He is fond of playing badminton. 2. Reading makes a man perfect. 3. Would you like having something coffee or tea? 4. I intend joining engineering next year. 5. King Francis enjoyed watching tiger fights. 6. We expect a patient hearing from you. 7. Feeling is believing indeed. 8. Singing is her favourite hobby. 9. Gambling is an evil habit. 10. The police accused him of killing. 11. The Woodcutter earned an honest living. 13. Drinking and gambling are two most prevalent vices. 14. He prevented me from going there. 15. I did it with a view of teasing him. Ans. 1. Quarreling with a child is absurd. Ans. 2. Finding fault with others is easy. Ans. 3. Playing with fire is dangerous. Ans. 4. Stealing is wrong. climb hills is difficult. Ans. 6. Ignoring the advice of teachers was their mistake. Ans. 7. Wasting your money is foolish. Ans. 8. Seeing is to believe. Ans. 9. Taking exercising is necessary for health. Ans. 10. Eating too much is harmful. 10. The police accused him of killing . 11. The Woodcutter earned an honest living .